Old school is the new cutting edge and our premium service includes domestic customer service professionals specifically trained to the requirements of your business or your campaign. They answer the phone quickly, they handle all of the callers needs, they're polite, they're efficient and they are well trained to make sure your bottom line is priority number one. Our technology incorporates the latest advancements in SMS/text capabilities to provide superior service to customers. Our agents can send follow up messages, directions, contact information, RMA numbers - the sky is the limit - right to your customer's mobile device. This helps your bottom line and gives your customers a value added service they will love. Study after study shows that they prefer to have information such as this right at their fingertips and available for easy reference. Whether you want to display a support link on your website, your product, your advertising medium, your fleet of vehicles or anywhere else you can imagine - CallCenter.com has your back. Our email support agents will respond with whatever level of urgency your business demands - from five minutes to one hour to one day - CallCenter.com is uniquely positioned to provide the level of service you need to achieve your business goals. Contact centers run on numbers. They are the most reliable barometer of what is happening with your customers and stakeholders and they are your best friend when it comes time to make tough decisions. At CallCenter.com, you get to decide what level of reporting you need and what format you need it in. Have you ever seen those cool little chat-bots on websites where the business offers, ``live customer support``? Have you ever wondered who is on the other end of those chats? Here's the answer: CallCenter.com is and we have live human beings doing the talking. This unique service can help to bring your customer service up to speed with the current technology and fulfill the demands of our increasingly fast-paced and ``right-now`` way of life. Maybe you're an expert in the dynamics of contact center science or maybe you're brand new at this need all the help you can get. In either case, CallCenter.com's crack team of support professionals can provide any level of project management your business or campaign requires. From script generation to marketing strategy, our team is well-positioned to ensure your contact center is the strongest link in your supply chain. We can create a successful campaign or customer response strategy for any type of business or service. Have you ever called your customers who have purchased your products or services to verify the shipping and billing information and enthusiastically welcome them to your brand? We can do that too. We have the experience you need to maintain a solid reputation with the BBB, other consumer reporting agencies and social media outlets. We're here to answer your customers. So you can do more of what you love. It’s not enough to just have a great product. Over 60% of customer’s will do business with your company again if they feel like they’ve had a good customer experience. Let us be the difference for your brand! 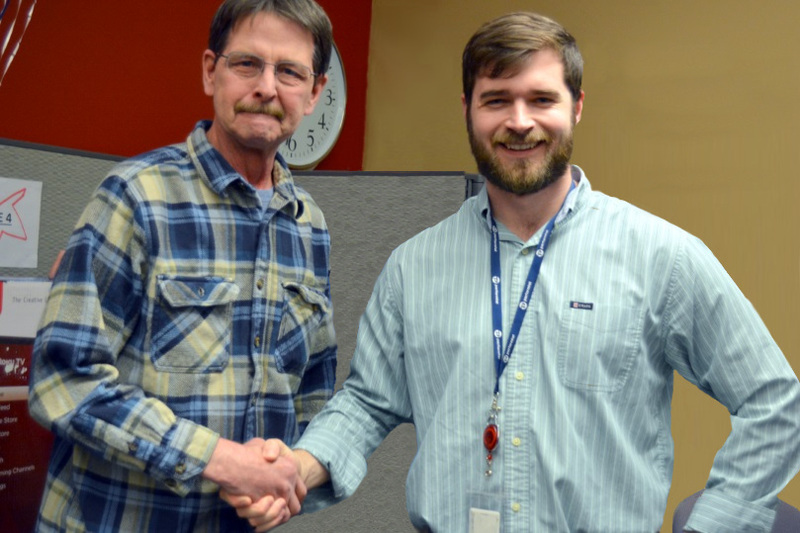 CallCenter.com CEO & Founder, Kyle Hannah, congratulates Customer Service Special Agent, Bob Gelschus, on a near-perfect attendance record. Bob won a flat-screen television for his unparalleled reliability.